Whenever we are asked to recommend a map this is the one we suggest. It is the most sturdy of the state maps. It is large, colorful and well-built. If you are thinking about introducing your children or grandchildren to coin collecting you just can't miss with the HE Harris state quarter map. The HE Harris state quarter map is built with quality to hold all minted state quarters including the 2009 territorial quarters. 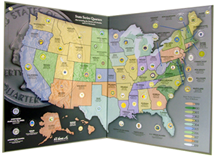 This state quarter map measures 26 inches by 16 inches when open (13" x 16" folded). It is built from heavy grade board stock and the outside has a vinyl material for added protection. This state quarter map also includes two brass grommets in the top corners to allow it to be hung from the ceiling or nailed on a wall. This state quarter map is color coded to match the quarter release dates by year. For example, California and Oregon are represented in blue for 2005 while Nevada and Colorado are in green for 2006. Each state is labled with the state name, the year that it came into the union and the capital city. This state quarter map includes spaces for all 50 state quarters within the map as well as District of Columbia, Puerto Rico, the U.S. Virgin Islands, Guam, American Samoa, and the Northern Mariana Islands. Individual states are color coded on the map with a legend that shows when each quarter was released. See more state quarter maps listed under "other products of interest" below. Click the following link to see our complete selection of state quarter maps. Does the map holder require the quarters to be in plastic coin capsules, or can they be put inserted in slot and stay put with out coin capsule? No capsules required. This map is designed to hold raw quarters collected out of general circulation. It works like a standard coin collecting folder. To be clear, it will not hold quarters in capsules. Will this map hold both P&D quarters?